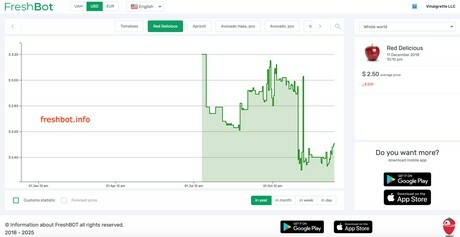 FreshBot; a phone application that affects market prices? The mobile application FreshBot was launched by a Ukrainian team who have direct knowledge of the export business and know how to sell products to dealers. The FreshBot service allows you to monitor prices for major fresh vegetables and fruits around the world in the context of countries and three distribution channels: wholesale, retail and from the grower. The main mission of the company and the application is to give all participants of the fruit and vegetable market a single instrument to influence market prices and raise awareness. FreshBot is a meeting place for buyers and sellers who personally influence the level of prices for products. When registering in an application, you can choose from several options: a farmer, a wholesaler (importers, exporters, distributors and other trading market participants), a user and a tracker (this functionality is still being worked on). Each of the above categories of users has its own interface, which includes a cabinet with the ability to set prices for products (simultaneously with the volume of products for sale). In the near future, each bidding, on a daily basis, will be duplicated on the marketplace, which is already preparing to launch. Registered farmers who have submitted all the necessary documents will be able to put up a lot for sale with one click and after 10 minutes receive calls from buyers or receive orders online in the application cabinet. The marketplace will be international, therefore, having inserted the appropriate settings in the cabinet, it will be possible to sell the goods for export. The FreshBot team presented its application at a specialized exhibition in Kiev Fresh Business Expo, where all visitors showed great interest in the resource itself and the ultimate goal of creating a full-fledged tool for trade in agricultural products. In addition to the application itself, the first Ukrainian resource www.freshbot.info was presented, which shows a picture of changes in prices for fresh fruits and vegetables in real time in the form of an exchange resource, where not only all user activity is displayed, but there is also a forecast of prices for future periods , as well as customs statistics of exports and imports. Summarizing the above, the FreshBot team encourages clients to not only register with the application to keep track of prices, but to also influence the market situation with your own hands. You can download the application in GooglePlay (for Android) and in Appstore (for iOS). A web source is available for free through this link.